Reeltime Pictures Ltd was founded in 1984 at a time when Doctor Who was going through an existential crisis at the BBC. The show went into an enforced hiatus in 1985 leaving fans with nothing to fall back on except their novelisations and a small handful of VHS releases. Although the company did not have a licence to make shows featuring the character of the Doctor this did not stop them producing stories based around characters which they could access. Likewise, they also had access to the actors and did a series of in-depth interviews with the most notable. 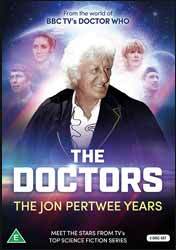 The Doctors: The Jon Pertwee Years gather together six hour long interviews on a two-disc DVD set. The set has an introduction (16 min, 31 sec) by producer Keith Barnfather, founder of Reeltime and a founding member of the Doctor Who Appreciation Society and Nicholas Briggs who has a long history with Who culminating in him providing the voice of various monsters, including the Daleks. The set contains interviews with Jon Pertwee (1 hr, 34 sec) who played the third incarnation of the Doctor, Katy Manning (57 min, 15 sec) who played companion Jo Grant, she would return to the role for the Sarah Jane Adventures. Adding to the companions we have Caroline John (1 hr, 55 min) who played the uber intelligent Liz Shaw, before the DVD set dips into the cast making up the main characters in UNIT. First off is Nicholas Courtney (55 min, 34 sec), who is so imbedded in the show's history that the character appeared in the new run of the show and Nicholas revisited the character in the Sarah Jane Adventures. Beloved of many fans he played Lethbridge-Stewart as a fearless soldier, but one with a moral centre. My best Doctor Who memory, and one that I carry around with me, is of the Brigadier standing his ground against an alien giving the order: "Chap with wings, there. Five rounds rapid!" Priceless. The last two interviews are with Richard Franklin, (52 min, 08 sec) who played Captain Yates and John Levene (58 min, 34 sec) who played Sergeant Benton, both characters played a fundamental role in Pertwee years. It would take too long to go through the contents of each of the interviews and would ultimately negate the point of watching them, but two notable points do emerge. The first is the genuine warmth that the actors had, not only towards one another, but also to the show. Secondly, the interviews are well constructed, spending as much time on the actor's backgrounds and other work. This ends up giving the viewer a much need depth. Although the picture is generally good, you must remember that these interviews are quite old, and I’d hazard a guess they were filmed on video tape as the picture does not have the crispness associated with film. Each of the interviews is presented with a 4:3 aspect ratio. Many of the actors have sadly passed away so this compilation of the original Myth Makers series is even more poignant.